Details of the long-standing, informal process of issuing letters to hundreds of Sinn Fein supporters has enraged the unionist leadership. For its part, Sinn Fein has insisted that their fury is misplaced and exaggerated, and accused the DUP of making political hay from a process which has gradually advanced the peace process over the past 14 years or more. It emerged this week during the trial of Donegal man John Downey in London, that he had received one of 188 ‘letters of clarification’, effectively ensuring he could not be prosecuted for his alleged role in an IRA campaign in 1982. While there were always signs that some outstanding prosecutions were being deliberately neglected or forgotten about, the news that hundreds of Sinn Fein supporters had been given a clear bill of legal health, some of whom might otherwise have faced IRA-related charges, created a frenzy among the political classes in the Six Counties. The manner in which the recipients had to be endorsed both by Sinn Fein and the British military created suspicions of a ‘dirty deal’, among both loyalist and republican hardliners alike. By Thursday, the situation had magnified to a point where the peace process itself appeared to be on the ropes. Those fears have since faded, however, and DUP leader Peter Robinson has backed away from his always unlikely threat to resign. For days, the Sinn Fein leadership battled to calm the waters as vigorously as unionists sought to agitate them. Senior Sinn Fein figures Gerry Kelly, Alex Maskey and Martin McGuinness largely succeeded in calming the initially hysterical response. They insisted the ‘deal’ was only a piece-meal British fulfilment of a clear commitment given in talks in 2001 -- that the legal persecution by the PSNI of the republican movement over (pre-1998) conflict events, would come to an end. Some process was considered inevitable when the 1998 Good Friday Agreement was signed, they pointed out. At numerous talks and summits, board meetings and round-tables, all sides were aware that the OTRs issue was being managed. But every answer to a question on the ‘comfort letters’ threw up new ones -- what promises were made, who received them, when they were received, and, most importantly, why. The announcement of a ‘judge-led’ inquiry by British Prime Minister David Cameron, in response to the carefully-framed demands by the First Minister, provided shelter from the storm on Thursday. Nevertheless, a tempestuous ‘emergency’ session of the Stormont Assembly today [Friday] saw the nationalist SDLP vote in favour of a DUP motion which expressed “grave concern” and “disgust” at what had happened. 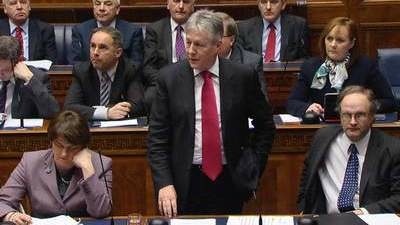 Peter Robinson accused former British Prime Minister Tony Blair of a “deliberate deception by omission” by not telling unionists or the SDLP about what he said had been a side-deal between his government and Sinn Fein. Deputy First Minister Martin McGuinness of Sinn Fein - which was the only party to vote against Friday’s motion - accused Mr Robinson of being irresponsible. He said: “I am frustrated that the stability of these institutions have been irresponsibly threatened this week and a sense of crisis has replaced the much-needed focus that we needed to get agreement on issues relating to the past. Mike Nesbitt, UUP leader, described the letters as a “perversion of justice” and added that his party was ruling itself out of any further Executive talks on the recent Haass negotiations, which aimed to formulate plans to deal with the past conflict, among others. TUV leader Jim Allister accused Peter Robinson of doing a u-turn over the issue, describing Cameron’s judge-led inquiry as “a farce and a whitewash”. Alliance Party leader David Ford expressed deep anger at the OTR process, which he said had continued as a ‘British security’ matter outside his authority as the so-called Six-County Minister for Justice. He said that there are potentially five cases, which are understood to have come forward in late 2012, still in the system and under examination by the British government. He told Assembly members that it was confirmed that responsibility for these does not rest with his department. “The Department of Justice has no part in this scheme, never had any part in this scheme and as long as I am minister will never have any part in this scheme,” he said.